In this case, the problem is hard to describe and a picture is worth a thousand words so here we go! I happened to get this strange output on a network- capable Microline 490. To me and many of you out there it might look like a driver issue. I will spare you some of the gory details suffice it to say. Here is the solution if you are using USB or a parallel connection to the printer: remove the network interface card from the back of the printer. It turns out that the card cannot be in the computer if you are not using it. 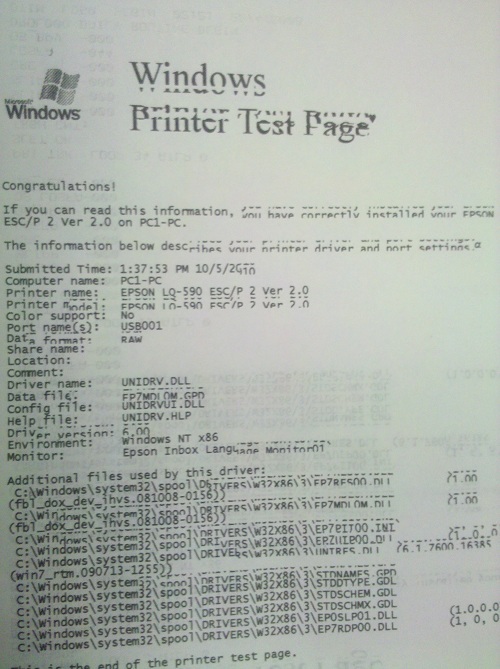 On a personal note, I am terribly sorry that you are supporting a dot matrix printer. Hopefully you will be working on something much more interesting soon. ← Unrecognized configuration section userSettings.